Beautiful sentiments, fabulous fragrances. East of India Candles are presented in beautifully designed tins. Each sentiment has a different fragrance and style of contemporary decorative design. In addition each tin has a little wooden plaque with a phrase or decoration. 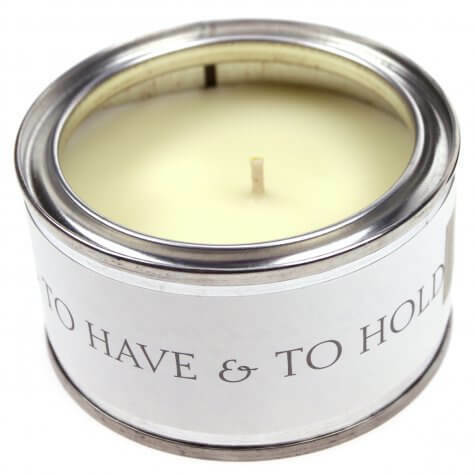 If you love candlelight and would love something a little different for your weding guests tables, or dotted around the venue at your wedding reception, why not choose these lovely wedding themed tinned candles from East of India. All with wedding themed labels (Congratulations, To Have and to Hold, Follow your Heart and Just Married) they would be cool and contemporary and they smell so good and we've got East of India retro matches too!! 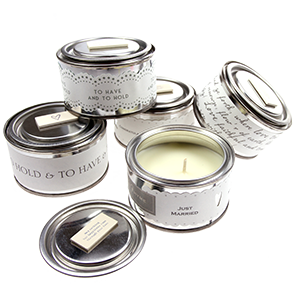 We also have our own 'Just Married' Confetti candles with the intense and sophisticated 'Classic Cotton' fragrance. 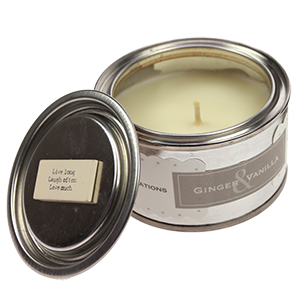 ‘Classic Cotton’ is a wonderful blend of bergamot, lemon, cyclamen, and sandalwood.